Richard Mille’s Pendule du Québec is built to the exacting standards and conventions of très Haute Horlogerie and required 6,571 hours of development, 5,451 components and 3,952 hours of assembly and adjustment. The Mayor of Quebec Mr. Régis Labeaume, Dominique Guenat and Richard Mille were all in attendance at the official presentation of the Richard Mille clock to Quebec City. This unique timepiece is a gift from the company and the Canton of Jura to the Province of Quebec and the event has particular significance for relations between the French-speaking countries, strengthening as it does the ties that link the Republic and Canton of Jura with the Province of Quebec. Christened “l’Horloge Porte-bonheur”, the project was launched in 2008 to celebrate the 400th anniversary of Quebec City, the biggest French-speaking city in North America. 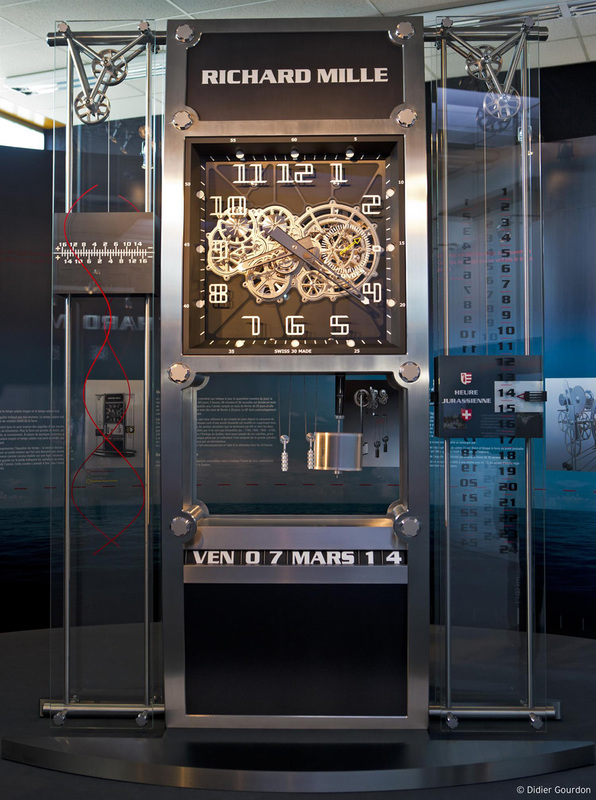 It took 6 years for the Richard Mille engineers working together with the technical college of Porrentruy and the Neuchâtel Haute École Arc, to design, manufacture, and assemble this monumental clock. It is the first clock designed and made to the exacting standards and conventions of très Haute Horlogerie and required 6,571 hours of development, 5,451 components and 3,952 hours of assembly and adjustment. The stainless steel case recalls the dynamic, curved design of RM watch cases. It is assembled with 16 spline screws and measures 350 x 250 x 130 cm, weighing in at 1,913 kg. 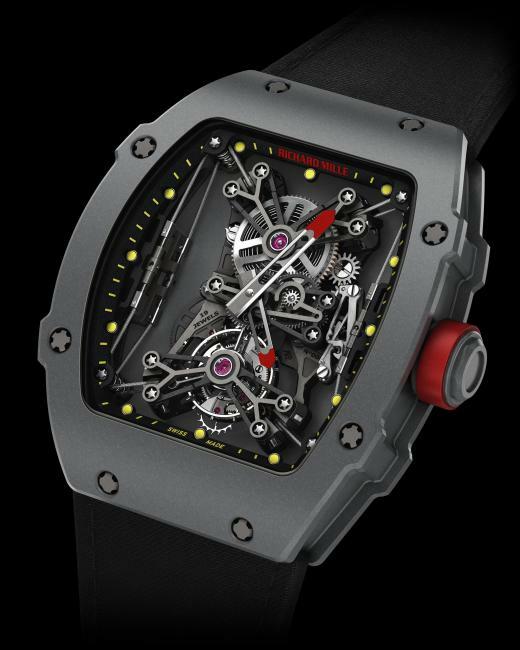 The Richard Mille clock ranks among the most consummately executed objects ever produced by the brand, which is understandable when you compare it to a watch: its components are between 300 and 500 times larger, and it weighs 100,000 times more than the RM 27-01 Rafael Nadal. The components of the Quebec clock are between 300 and 500 times larger, and it weighs 100,000 times more than the RM 27-01 Rafael Nadal. This unique timepiece has two faces showing two different displays: on one side you can see the hours and minutes, while the other face displays seconds, minutes, hours and a perpetual calendar. The movement encapsulates all the inspiration and imagination that the brand injects into its designs. The impressive dial and hands skim over the plate and the ribbed bridges, which recall the central bridges of an RM 003. The other bridges are reminiscent of the RM 055, and the baseplate itself recalls the RM 005. In all, the clock comprises 3,600 parts made of brass, stainless steel, titanium, aluminium, ceramic and ruby. You can see the calibre, gear-trains and balance wheel through the anti-reflective treated mineral glass all around the movement. The designers of this movement have made use of horological grandes complications to ensure optimum chronometry, such as the constant-force device, a rare mechanism of extraordinary complexity that compensates for the different negative influences arising from the weight of the hands, and the tiny variations in force due to the many toothed wheels. This cam mechanism releases and blocks the force of the daily weight transmitted by two big wheels. At the same time, an equation of the time mechanism operates through the intermediary of a driving-weight which descends once a year. During its slow course, this weight operates as a mobile slide-contact along a sinuous red line etched into the glass. In combination with the scale engraved onto the weight, this line indicates the variations in minutes between real time and average time during the course of the year. To remind everyone of the clock’s provenance and its strongly symbolic stature, a second timezone – that of the Jura in Switzerland – is displayed all along the glass column, made visible by the ascending movement of a specific window. As with all Richard Mille watches, the entire movement and case are hand-finished to ensure this piece of Haute Horlogerie is a work of perfection. The fine quality of satin-finishing, micro-bead blasting, polishing and surface treatments are a glowing tribute to the craftsmanship of Richard Mille watchmakers and decorators as well as the students of the Porrentruy technical college and Haute École Arc. The Richard Mille clock is on display at Porrentruy from 7 March to 3 May 2014 and will then be installed in the Jardins de l’Hôtel de Ville in Quebec, where it will stand permanently as a symbol of the strong friendship between Quebec and the Republic and Canton of Jura.